Back in the 60s, astronauts had to compete with monkeys to make their way into space. 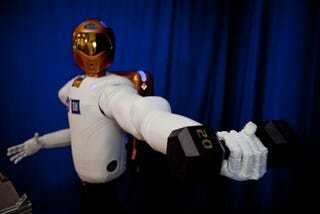 Today, NASA and GM have developed a new trainable, expendable crew member. Its name is Robonaut2. Ambidextrous and designed to use the same tools as humans, Robonaut2 can lift up to 20lbs (just check out that lead photo!) and operate in environments too dangerous or inconvenient for humans to work. From what we can tell given the past decade of Robonaut development, the system is loaded with technologies like head tracking, so Robonaut can autonomously watch a human's every move, but the limited AI seems to take the backseat as Robonaut is more of a VR controlled construction worker than a HAL on legs.